In 2016, total income was $1.2 million; total expenses were $1.2 million. According to information released by donors, JLAC received a core funding grant of $605,000 (2014-2017) from the Human Rights and International Humanitarian Law Secretariat (joint funding from Denmark, the Netherlands, Sweden, and Switzerland). Between January-December 2016, JLAC was an “implementing partner” for a project through the Norwegian Refugee Council for $6.8 million to “protect the rights of Palestinians in the West Bank and Gaza Strip affected by displacement.” Other implementing partners were Society of St. Ives, HaMoked, Community Action Centre, Yesh Din, Bimkom, Palestinian Centre for Democracy and Conflict Resolution (PCDCR), Palestinian Centre for Human Rights (PCHR), and Al-Mezan. 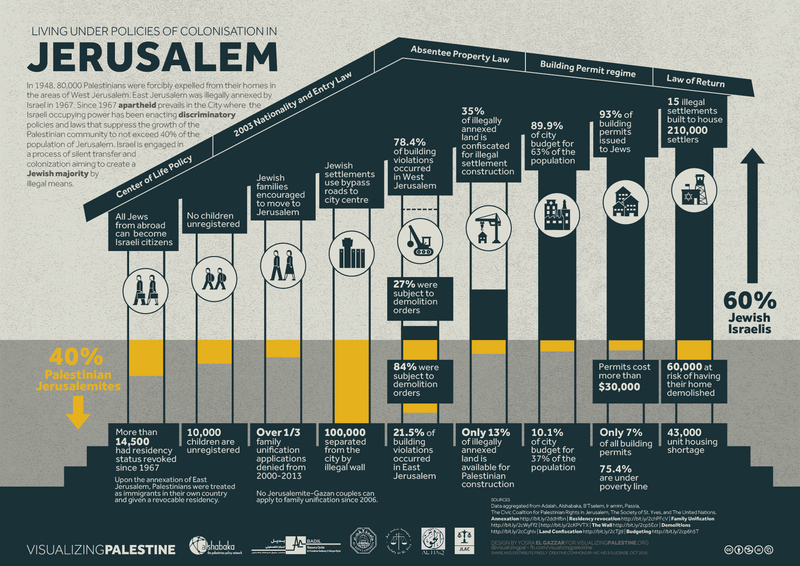 In January 2017, JLAC, alongside Al-Haq, Society of St. Yves, Al-Shabaka, and BADIL, released an infographic aimed at “raising awareness of Israel’s apartheid policies in the city, its effects on the Palestinian population, and the gross violations of international humanitarian and human rights law that arise.” The infographic claims that “Since 1967, apartheid prevails” and that Israel has “been enacting discriminatory policies” in Jerusalem. As a member of the Palestinian Human Rights Organisations Council (PHROC), JLAC referred to the resignation of William Schabas as the head of the UN inquiry into the 2014 Gaza war as a “charade put up by Israel” and “condemn[ed] in the strongest terms Israel’s latest and unfortunately far too common attempt to obstruct the work of the international human rights and justice mechanisms in investigating Israeli violations of international law against the Palestinian population.” In fact, the resignation followed revelations that Schabas had previously done legal work for the Palestinian Liberation Organization (PLO) – a clear conflict of interest that would have disqualified him from the beginning if it had been disclosed. Furthermore, Schabas’ record of anti-Israel biases includes repeated calls for prosecuting Israeli officials for alleged “war crimes” at the International Criminal Court. In February 2016, issued a joint statement that “For decades, Israel has failed to uphold its duties as Occupying Power and has instead deepened its occupation and regime of colonialism and apartheid” and “affirm[ed] the right of all individuals to participate in and advocate for boycott, divestment, and sanction actions, and calls on states and businesses to uphold their related legal responsibilities” and stated that the EU November 2015 labeling move against Israeli settlement products is “insufficient,” calling for a complete ban (emphasis added). Board member of the Palestinian NGO Network (PNGO), which refused to sign the anti-terror clause that is a condition of US government funding, stating “that its members would not sign funding agreements that included the ATC [Anti-Terror Certificate]: this is now a condition for membership under PNGO byelaws [sic]” (emphasis added). Also a member of The Coalition for Jerusalem, The Palestinian Coalition against Torture, The Palestinian Coalition against the Death Penalty, The Coordinating Council of Civil Action, The Media and Human Rights Civil Coalition for Ensuring the Execution of Court Decisions, The Civil Team in Support of the Transparency of the Public Budget, and The Palestinian NGOs Code of Conduct Coalition.